Nicolas Cage is back…at being Nicolas Cage. Let me be clear, there is nothing wrong with that. Why we love or hate him is solely based on the degree of which his his “eccentric” nature is successfully married to a project. It seems like it should be easy, but that winning combination is elusive. Lately, things have been more like punishingly the slow and misguided Bangkok Dangerous (2008) and less of the fun, action oriented The Rock (1996) or emotionally heartbreaking Leaving Las Vegas (1995). Hell, I would even take his nasally odd performance in Peggy Sue Got Married (1986) at this point. So how does Mandy fair? Very well. Very well, indeed. Mandy (2018) is set in the Shadow Mountains of California in 1983. This dark and brooding offering is from director Panos Cosmatos, whose only other feature directing credit is Beyond the Black Rainbow (2010). The film is co-written with Srewart-Ahn and has music by recently passed composer, Jóhann Jóhannsson. The film has a nature-based claustrophobia that holds the audience close and tempts the brain with a dense, sensory overload that will certainly drive a desire to re-watch. It is a violent and seductive revenge tale old. Told in the ancient style of the early 1980’s. The 3 act story is mostly strong and carried by Nicholas Cage in his signature big eyes, big heart style. His character, Red Miller, is a relatable, loving partner and his motivations are clear and affecting. Side note: he is one of the only actors that can pull off a full beard without devolving into full on machismo. (Gotta love you some NC for that.) His wife, Mandy Bloom, played by Andrea Riseborough (Birdman or The Unexpected Virtue of Ignorance, Oblivion) is a talented, macabre soul, embracing a life in seclusion. They really have an eerie chemistry that is somewhat puzzling but genuine. The tone of the film shifts pretty dramatically between each act and really challenges the audience to trust the director in what kind of film he wanted this to be. The music is distorted and tension sustaining and cinematography is a colorful, LSD encouraged, fever dream. Both keeps us grounded and provide the perfect base for Nicolas Cage to shine. The film succeeds in keeping the villains terrifying without falling flat, like in earlier works such as 8MM(1999). 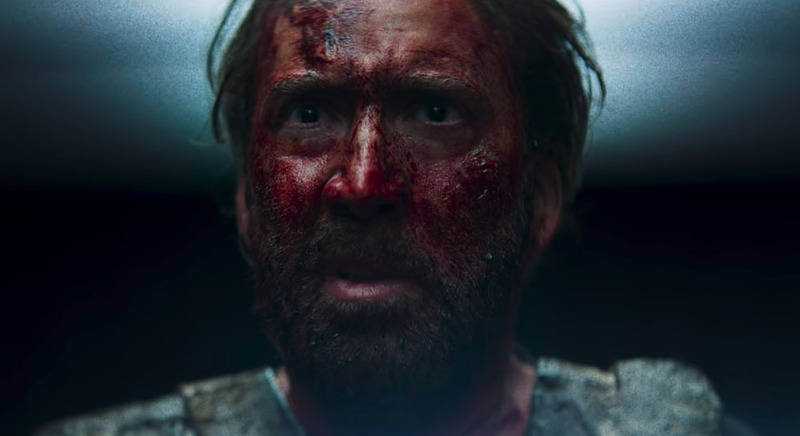 Where in 8MM, the reveal of the villain felt hollow and unsatisfying, the Mandy antagonists are operating on multiple levels of evil. Is there enough of Red to make it through the hell they’ve created? I am willing to bet Tacos to Pesos that the film had some inspiration from The Crow. (Not the tv show, that monstrosity can go to hell and die.) The story’s theme seems like a beautiful tribute to the early 90’s Brandon Lee vehicle. (Even after all these years, Brandon Lee’s death still hurts. RIP, mang.) I think they get it right. I give this film 4 out of 5 Filmchiladas, as it is a near perfect horror/revenge film that knows its subject matter is over the top. It doesn’t let that discourage its style or manic energy and it gets extra points for introducing supernatural elements in a believable and creepy manner. 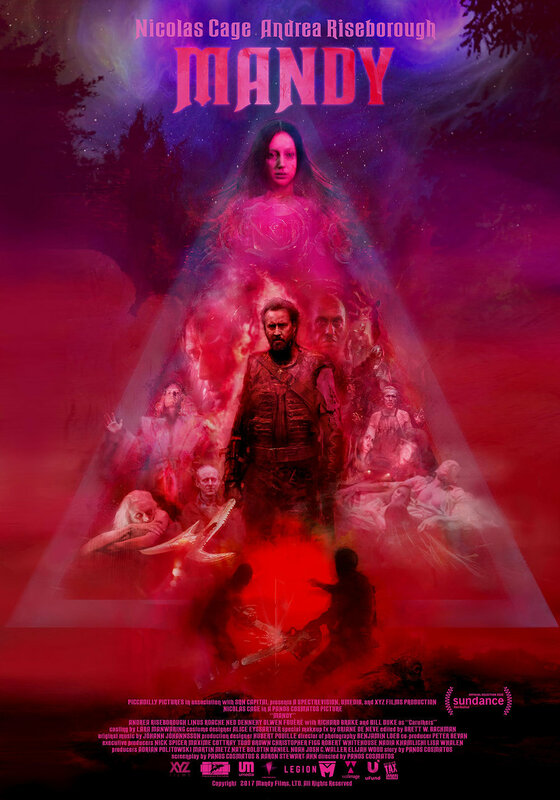 Mandy is currently in theaters and available on Amazon Prime, YouTube and iTunes.